"Rivington Street was the lively one, eternally jammed with pushcart peddlers hawking their wares. They had every imaginable commodity, from a needle to a wedding outfit... Emotional, tempestuous, harrowing Rivington Street was perpetually a steaming, bubbling pot of human flesh." This short tale of Lower East Side life captures the hustle and bustle of Rivington Street through the lens of legendary Hollywood director D.W. Griffith. After the death of her mother, Ruth struggles to support herself as a seamstress. As she delivers her bundle of shirts to the factory owner, the owner's son steals some money and Ruth is accused of the crime. She then flees the ghetto and hides in the country where a young farmer takes her in and they fall in love. 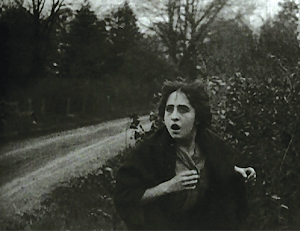 A Child of the Ghetto was made at the height of Griffith's career at Biograph, a period when he was perfecting the storytelling power of the film medium. 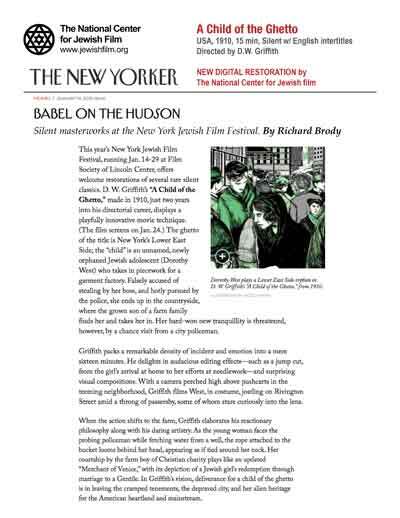 Like Romance of a Jewess, this is a story of Lower East Side life, and Griffith again captures in near-documentary style the hustle and bustle of Rivington Street. 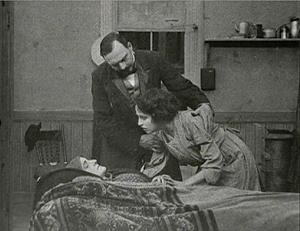 Griffith's development of editing techniques since 1908 is evident; although both films are about the same length, A Child of the Ghetto has forty-six shots while Romance of a Jewess has only thriteen! The movement from city slums to pastoral country differentiates A Child of the Ghetto from most other American Jewish films of this period. The city is seen as a place of hardship, exploitation, and false accusation, while the country offers health, trust, beauty, and love. Griffith seems to indicate that immigrant Jews would improve their lives by moving out of the ghetto, a possibility entertained by few other films. A Child of the Ghetto is also one of the earliest films to treat an interfaith romance unproblematically. New original score by Swedish musicians Alexander Freudenthal & Hans Nyman recorded in Stockholm.